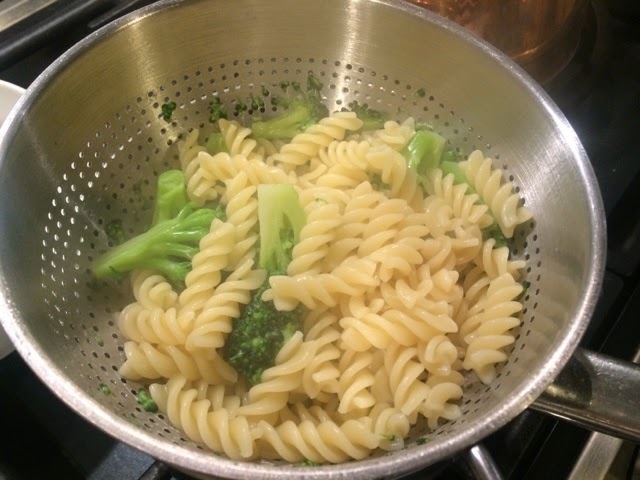 For me, nothing make’s a better midweek dinner than a delicious bowl of pasta. It’s the ultimate fast food. 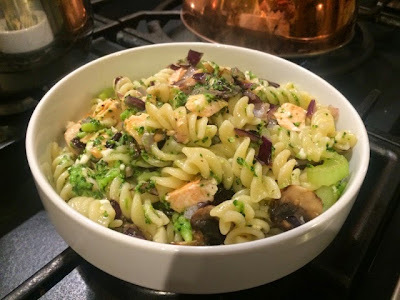 It can be easy to get stuck in a rut of adding the same old ingredients over and over again though (I’m a massive pesto fiend) so I try as much as possible to mix it up a bit so make a different dish each time and keep it interesting. I had a few salmon fillets in the fridge that needed to be used up so while my pasta was cooking I roasted both in the oven. One went into the pasta dish and one to have with salad in a packed lunch the next day. Wrapped in foil the salmon fillets only take around twenty minutes in a preheated oven which is just the right amount of time to get the pasta cooking and the prep and cook the accompanying vegetables. 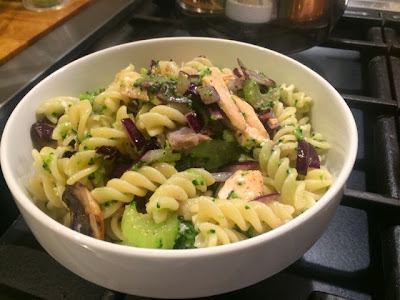 To keep a pasta dish from seeming dry my go to sauce has always been pesto, I can’t get enough of the stuff, particularly when it’s homemade). However, in the interest of keeping things different, this time I went down a bit of a different road. Adding a drizzle of good olive oil and crumbling up the feta really small rather than in big chunks or cubes creates a really nice creamy effect without having to make a ‘proper sauce’. 2. Place the salmon on a sheet of foil, season well with salt and pepper and sprinkle with oregano. 3. Put the pasta on to boil according to the packet instructions in well salted water. Throw the broccoli in to cook in the same pan. 4. Sautée the red onion and celery in a small amount of oil in a separate frying pan, when softened add the mushrooms. 5. When the pasta, broccoli and vegetables are cooked the salmon should be ready. Remove from the oven and check it’s cooked all the way through. 6. 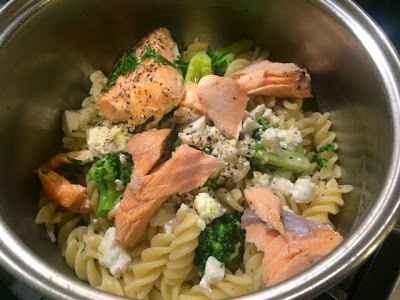 Drain the pasta retaining a small amount of water in the pan, flake the salmon into the pan, crumble in the feta and drizzle over a small amount of olive oil. Season generously with salt and pepper. 7. Add the onions and other sautéed vegetables and combine everything together ensuring it’s all evenly mixed.